Read the first part of this series, The 3 Causes of Sibling Rivalry before you read the second part. If you understand what causes sibling fighting, you’ll be better equipped to help your children work through their disagreements. When my kids fight, it makes me feel pretty lousy about my parenting skills. It feels like somewhere along the way, I took a right turn where I should have taken a left or two lefts and a right and ended up hundreds of miles away from the intended destination. Obviously, having kids that fight like cats and dogs was never the destination! Why can’t they just get along I think as I reach into the candy drawer. Because the bottom line is, when my kids fight, it not only hurts them, but I think it hurts me more. I feel like I’m failing when my kids can’t get along and then I start second guessing if I’m working hard enough to create a positive and loving home for them. And then I had this lightbulb moment that would snap me out of my worrying and second guessing my parenting! It hit me that sibling fighting is completely, totally normal and that I can use my own actions – how I treat my kids and respond to their sibling spats – to positively impact all of us. 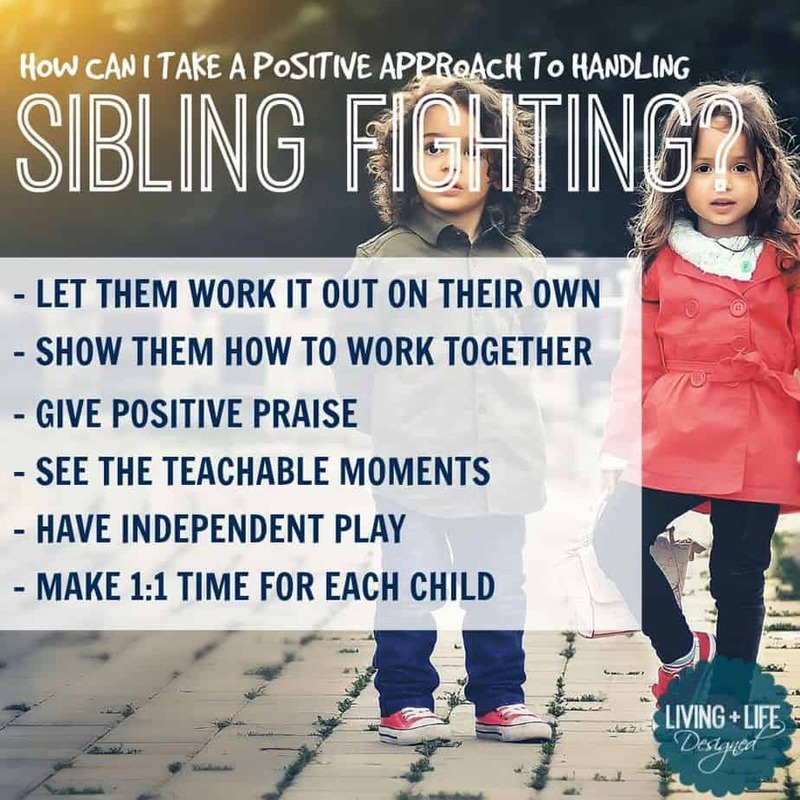 Yes, sibling fighting can be in response to the way the home is structured, or how some parents treat their children (unintentionally and maybe even intentionally) but ultimately, these situations that cause us to be angry or frustrated, are actually opportunities for teachable moments. Teachable moments will ultimately help our kids develop into well-rounded people with solid communication and conflict resolution skills, and that’s not such a bad thing, right? Sibling fighting is normal, but just like most behavior, sibling spats are a big, fat fascade to something else that is actually going on. It’s up to parents to identify the root cause. For example, is my son acting out towards his sister because he’s jealous of the attention she gets from me and trying to get me to pay more attention to him? If this is the root cause, I can create more opportunities for one-on-one time with my son to help him feel that my time is balanced between the two of them. We have to figure out the psychology behind the actions, in order too help our kids create a resolution. I used to jump in with our kids at the slightest start of an argument. I would separate them or distract them from the problem they were having, but ultimately one kid was always leaving upset and unhappy with the resolution of my peace talks. And then one day, too exhausted to jump in, I let them work out the problem on their own and I sat there and watched them. Letting them work it out teaches kids how to communicate with each other and find solutions, all on their own. Read about How to Help Develop an Emotionally Intelligent Child and learn to recognize and communicate feelings. There are some exceptions to this rule, and helping kids reach common ground may not always be attainable. When it hits that point in the day – we all know the point where our kids are hungry and tired and no amount of letting them work it out, is actually going to work – its Ok to step in and diffuse the situation and offer an alternative. For example, if my kids are playing outside and fighting over a swing on the swing set or a riding toy, we switch gears, head on inside to play in the playroom or watch a 20-minute show to chill out. Now, if your kid’s disagreement gets to the point of hitting or someone is being hurt or about to be hurt, parents need to intervene immediately. Finding common ground might be impossible during this time and requires times to calm down, time on their own and separated from each other and then time to think and talk through their emotions. Pair your kids together for a little teamwork during the day to show them that working together can help them accomplish a task or goal. For example, ask your kids to each hold the side of a heavy box and help bring it in the house, have them unload the groceries from the car or have one child sweep and the other hold the dustpan so that they work together. I will ask all three of my kids to work together to clean up the playroom so that we can go on a bike ride or a walk once they’re done. When I offer the kids an incentive, they will help one another finish the task faster when they’re working towards something they all want. Note that I don’t offer rewards or sweets as a form of bribery to get my children to do something. If we have something during the day that was already planned as part of our day that they’re excited to do, I will use that as an incentive to have them work together. Ideas include snack time, lunch, dinner, a walk, an outing, a visitor coming over, a bike ride, etc. Look for opportunities to point out positive behavior between your children when they’re playing nice and working well together. Are they sharing, being kind, complimenting one another or helping their sibling? Look for good behavior and offer strategic praise so your kids notice the ways they behavior solicits positive reactions. Read More about Why Having a Positive Home is So Important and will Affect Your Children Forever. Use the opportunity of sibling bickering as a teachable moment to talk about being empathetic, kind, aware of other’s feelings and needs. Step in not to referee your children, but to help them develop healthy conflict resolution skills by learning how to recognize their own feelings, put a name to them and use words that explain them to help resolve conflicts. Listen to both of your children tell their “side of the story” away from one another and then tell the stories back to them when they’ve come together. Help them talk about their feelings during the conflict and ask them to find a solution they both agree on. Be non-judgmental when you listen to your children talk to you and don’t impose your thoughts into the discussion but use the moment as a teaching tool to help them explain themselves and find to common ground on their own. If your children are together most of the day, make sure you implement time for them to play independently so they get a break from other family members. I use quiet time during the day while our littlest one is napping. The kids play independently of each other for 45-60 minutes before they come together again. Children can act out in aggressive ways towards their parents and especially towards their siblings when they aren’t getting the individual attention they need. Seeking opportunities to have one-on-one time with your children doesn’t have to involve babysitters or extra curricular activities, there are simple ways to get this quality time with each of your children every day. Read here for 8 simple ideas to get one-on-one time with your kids each day. 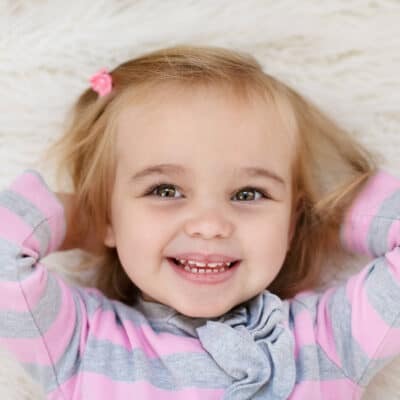 The one-on-one time connecting with your kids, is absolutely necessary to strengthen the parent-child relationship, build their own confidence and helps to foster a more positive and peaceful home life, especially among siblings. Individual connection time helps strengthen their confidence in the family pyramid and swats away feelings of insecurity that can help create sibling tensions and ultimately, sibling fighting.